After a 30km bike ride and climbing 3 first category mountain passes, the class ends with a mass sprint. Who has the strongest legs, the highest explosive accelerating power and the stamina to handle a long sprint? Spinning at the USC is more fun now than ever before! Guided by uplifting music you will cycle your way to an excellent fitness. Starting slowly; then picking up speed towards the final sprint, and all this while under the expert guidance of a team of very enthusiastic and motivating instructors. Although cycling and spinning are endurance sports, explosive strength and strength endurance are of great importance if you want to improve. On short, steep inclinations it can be a choice between ‘keep cycling or getting off’. Whether or not you can stay on your bike is dependent on your explosive strength. As well as this, your strength training mainly needs to focus on improving the maximum endurance capacity - strength that can often be developed and kept up for long periods of time with little resistance or weight. We would advise specialised strength exercises to increase the strength in the legs, as well as taking part in the spinning classes. Because cycling is demanding on the back and core stability, it is important not to forget these muscle groups. Ask our fitness instructors for a workout schedule to fit your needs. To take part in group classes you will need to be in possession of a valid sport subscription. There is no need to register. Don’t forget to bring a towel and bottle of water! There are only 25 places available for each class. The Virtual Spinning classes take 30 minutes with the exception of the class of 12.00 hrs, that one is one hour. Virtual spinning classes at the USC are quality 30 minute classes. These short training sessions are held 5 times a day, so you can attend spinning in the morning or afternoon. 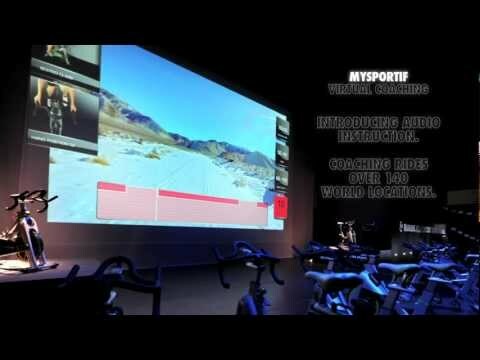 Virtual Spinning is a unique experience with beautiful images of different stages from a number of locations. Come along, join in and discover how much fun it is!